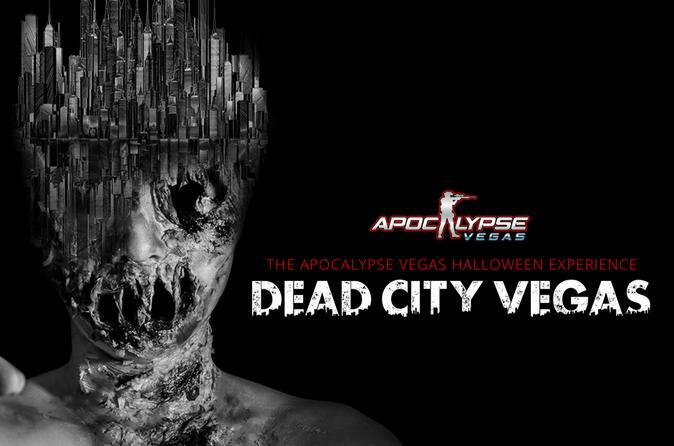 Enter into Dead City Vegas...Las Vegas' largest and only interactive haunted house, where YOU can fight back! The 38,000 square-foot indoor maze will take guests through an up-close and personal terror in a dark and ominous apocalyptic scene. Skilled special ops personnel will guide thrill-seekers through 13 haunted houses featuring a gauntlet of sound effects and spooky deserted neighborhoods. Guests will dodge live zombies wreaking havoc, look for weapons and fight back with those weapons as they work their way through the haunted houses and streets filled with the undead. Every ten minutes we will release a new group into Dead City Vegas, a 38,000 sq ft indoor state of the art attraction just minutes from the strip across from The Rio Hotel & Casino. All you have is one survivor who will lead you through a massive neighborhood with live zombies! In 20 adrenaline packed minutes, you must avoid the undead threat and eliminate the infected by finding your weapons through 13 houses. This is one haunted attraction you've never done before. There is no transportation available for this experience and guests must arrive 10 minutes before show start time. Please wear appropriate clothing such as closed toed shoes, in order to move efficiently through a maze like environment and ensure you get out alive!